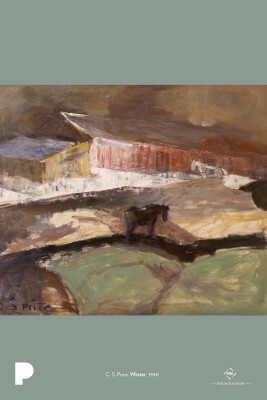 One of the most fascinating and influential early artists to settle in the Pacific Northwest, Clayton Sumner Price spent his early years as a homesteader and cowhand in eastern Wyoming and Alberta, Canada. When work permitted, he sketched the animals and landscape around him. Shortly after 1905, Price began to secure work as an illustrator of Western stories in such magazines as Pacific Monthly (now Sunset). In 1920 Price moved to Monterey, California, where he met other artists and became interested in Modernism. Price began an intense and elemental artistic exploration, fusing form with the emotional power of color. His art continued to reflect an intimate understanding of the cowboy life he lived, even as he moved away from illustration to develop a powerful form of expression, which, in later works, bordered on pure abstraction. His dedicated studio practice resulted in a mature personal style more closely aligned with Cubism and German Expressionism. He joined his relatives in Portland, Oregon, in 1929, devoting himself to painting until the end of his life. His search for the “one big thing,” the spiritual center of life through art, guided his artistic vision. An artistic movement begun in 1907, when artists Pablo Picasso and Georges Braque together developed a visual language whose geometric planes and compressed space challenged the conventions of representation in painting. Traditional subjects—nudes, landscapes, and still lifes—were reinvented as increasingly fragmented compositions. Its influence extended to an international network of artists working in Paris in those years and beyond. An international artistic movement in art, architecture, literature, and performance that flourished between 1905 and 1920, especially in Germany and Austria, that favored the expression of subjective emotions and experience over depictions of objective reality. Conventions of Expressionist style include distortion, exaggeration, fantasy, and vivid, jarring, violent, or dynamic application of color. An art movement characterized by the deliberate departure from tradition and the use of innovative forms of expression that distinguish many styles in the arts and literature of the late nineteenth and early twentieth centuries. Look closely at this image. What do you see? How would it feel to be in this place? What is the temperature? How close is the nearest neighbor or the nearest town? How do you feel as you look at this landscape? What emotions does this image convey? Does the landscape look familiar or strange? Would you like to be there? Consider Price’s use of line, form, and color. Where does your eye move as you look at this painting? In what direction are the lines going? If you step back from the image, what geometric shapes or patterns do you notice? What colors does Price include in this painting? Which areas are light and which are dark? How do all of these qualities contribute to the painting’s mood and meaning? In what ways is this work realist and in what ways is it abstract? Identify specific elements of the work that support your response. Draw or paint the scene outside of your house or school. What colors would you choose? What shapes do you see?